Discussion Meeting is Wednesday, June 13th, at 12:00pm in the Community Room. She has as much business keeping a stray dog as she would walking across Egypt–which not so incidentally is the title of her favorite hymn. She’s Mattie Rigsbee, an independent, strong-minded senior citizen who, at seventy-eight, might be slowing down just a bit. When teenage delinquent Wesley Benfield drops in on her life, he is even less likely a companion than the stray dog. But, of course, the dog never tasted her mouth-watering pound cake. 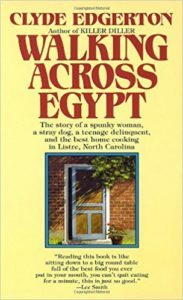 Wise and witty, down-home and real, Walking Across Egypt is a book for everyone.